Reasonably Priced, Convenientally Located, Cottage/House With Private Deck. The perfect little place to start and end your daily Eureka Springs adventure! 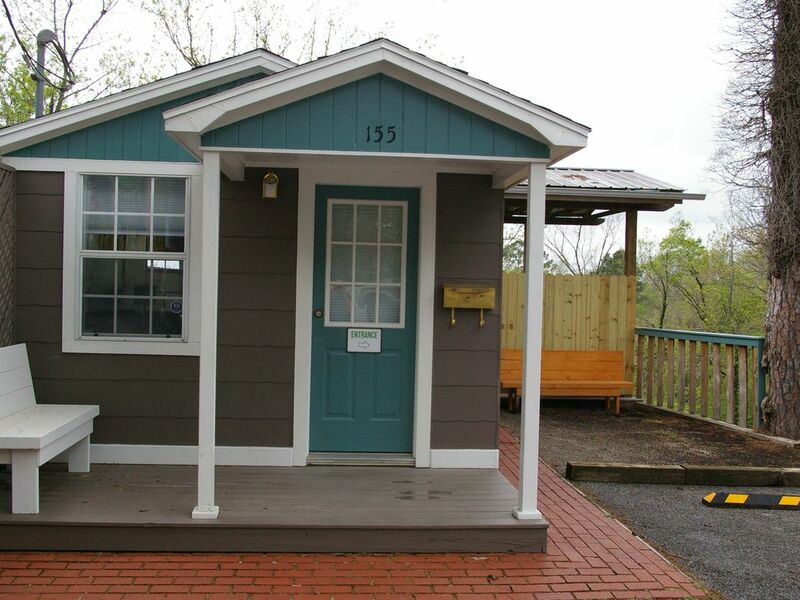 In the 1950s, long before the term “tiny house” became popular, a one-room, very small house was built in Eureka Springs, Arkansas. That small house served its owner as a private residence for over 40 years! In 1999, the house was purchased and converted by the new owner, Roscoe, into Eureka Springs' first internet espresso cafe. The little cafe could seat 10 customers inside and another 10 on the deck. Roscoe was a long-time, well-known Eureka Springs resident, musician, and motorcyclist. “Roscoe's” soon became the hangout of choice for a variety of unique and interesting local characters as well as a tourist destination and attraction on its own. “Roscoe's” was a fixture in Eureka Springs until Roscoe made the decision in 2017 to close his business and retire. bike rack for dry, safe storage. 4. Eureka Springs Community Center. The City Trolley and Welcome Center is also close-by. Park your car at Small House and ride the trolleys from the Welcome Center to every part of town and to nearby outlying attractions. Coffee, assorted teas, hot chocolate. Smart Television with Direct TV Now and Netflix. Deck with privacy fence overlooking wooded area. Bicycle rack on deck for dry, secure storage. My husband and I fell in love with this cozy cabin. It has been nicely updated and had all the comforts of home. Walking distance to the invaluable trolley/bus and it has a great deck for cocktails and/or coffee! Couldn't have been happier. Our stay at the little house was truly awesome! It was so clean and nicely decorated. The bed and linens were wonderful. They were much better quality than a hotel. Everything was just as Robert said it would be. He is such a nice person and we’re so happy we got to meet him. All in all we had a much needed vacation. We will stay there again. Thank you Robert! I don't get to personally meet everyone who stays at Small House but I am glad that I was able to meet you two. You are both delightful people and it was my pleasure to be able to give you some "tour guide" advice and help make your trip to Eureka Springs the vacation that you wanted it to be! Come back anytime! Loved our choice with the small house! Loved the small house! Such a perfect place to stay ! Had everything we needed. The decor is in gray tones with red accents in the chairs. Good sized tv that you can enjoy Netflix, amazon prime or direct now. Water and coffee supplies were furnished and the deck is amazing. Location is on the main drag so very convenient to all locations. You can hear traffic sometimes when air kicks off but really not a major distraction. King bed is very comfortable. A parking spot is provided and in view . Would highly recommend for anyone wanting a unique spot of your own away from home. Thanks Robert! Thank you Mary Ann! Your review made us proud . . . proud that our property was up to your standards and met your needs so successfully. As a family owned lodging, we really do want Small House to be “a unique spot of your own away from home.” My grandson, who is our “advertising department,” thinks we should adopt this as a tagline! Please come back again soon, you are not that far away! Could not ask for more! We have been staying in Eureka Springs for years and this is a wonderful place to stay! More room than you would expect and very modern. Absolutely loved the deck! Will definitely stay again! Loved the Rockin Pig! You have a great place and very clean! Thanks for a great stay! Eureka is so welcoming and relaxing! Much needed! Thank you for the very positive review! Very quaint with everything you need. Clean, comfortable bed. Enjoyed the back patio. Would stay again! We are happy to hear that Small House was exactly what you needed. We hope that your entire visit to Eureka Springs was "perfect!" Come back again soon. This was an excellent place to stay. Nicely updated, comfortable, and has everything you need. The back patio is a great place to enjoy your coffee in the morning. It is close enough to walk downtown to avoid having to park. I will be looking to book again for my next eureka springs trip. Thank you for the very positive review. We hope to see you again soon.